Want to experience Alaska? This tour offers the opportunity to explore magnificent backcountry with an unforgettable guided hike! Your naturalist guide will lead you on a tailor made adventure walk above the tree line. 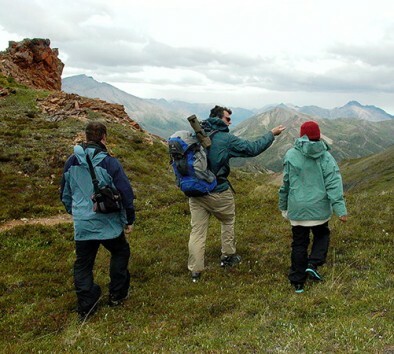 Track animals, learn the history of the area and relax on a hillside overlooking the valleys of the Alaska Range. Take in the spectacular views while enjoying a small snack. Minimum age is 2. Wear comfortable walking shoes. Dress in warm layers. Bring a camera. Over boots, jackets, hats and gloves are provided. Flight time is approximately 15 minutes. Hiking time is approximately 3 – 3½ hours.